How is it that a faith that began in 1st century Palestine with a handful of followers has become the largest movement the world has ever known? 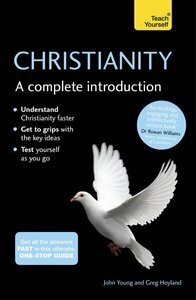 Christianity: A Complete Introduction traces the story of the Christian faith from sandals to cyberspace. It describes the origins and key ideas of Christianity and gives an account of how it looks in the modern world. Socially, scientifically, economically and politically, Christianity today inhabits a very different world from that of Jesus of Nazareth and his early disciples. Yet it seems to possess an inherent ability to survive and thrive in the face of great change. It remains a compelling and powerful faith in the modern world, with a rich and diverse heritage. Whether you are preparing for an essay, studying for an exam, or simply want to expand your knowledge, Christianity: A Complete Introduction is your go-to guide. About "Christianity: A Complete Introduction"
John Young was born and bred in Lithgow, NSW, and has been actively involved in teaching others about Jesus since the nineties. John completed both a Diploma of Divinity and Mission and a Bachelor of Theology at the Sydney Missionary and Bible College. John and his wife Kristen have two children and currently serve God together at Lithgow Anglican Church, where they oversee the Youth, Children's, and Young Adults' ministries.